A lovely plant from North America, with large white crepe-paper flowers from July to September. 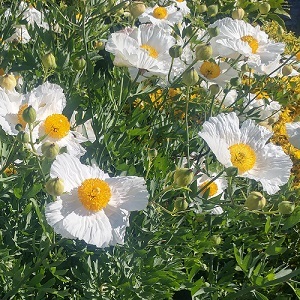 The flowers resemble large poppies. Plants have attractive grey-green leaves and grow up to 1.5m in height. These are great border plants and look lovely against a sheltered sunny wall. They grow well in warmer UK and Mediterranean gardens. Tree Poppies grow best in sunny well-drained soils, with some protection against cold winds. They grow in coastal gardens. In colder gardens the plants need mulching in winter to protect the roots. The plants die back in winter and re-grow in spring. Pack of 50 seeds. Sowing is erratic and tricky and takes time, so sow more than you need and don’t give up too quickly. Sow anytime including a month in a fridge or sow in autumn for germination in the spring. Sowing instructions and a colour photo are printed on the packet. Sow the seeds anytime on the surface of a tray of moist compost and press the seeds into the compost. Keep at 18 -22°C for 2-4 weeks, then move to a fridge for a month and back into the warmth for germination, which is erratic over several months. Or sow the seeds in autumn in a coldframe or cold greenhouse and they start to germinate in spring. Or you may wish to try storing the seeds in layers of damp sand in a cool shady place and then sow the seeds as they start to sprout. Tree Poppies resent root disturbance and may die when planted out, so be gentle at this stage. They become vigorous plants once established. Plants die back in winter and the dead plant material can be removed in spring. Protect the plants from caterpillar damage. In the right conditions plants spread quickly by underground suckers. Basal cuttings can be taken in spring.